Macaws – New World Parrots!! Scarlet macaws are considered to be among the most beautiful birds because of their impressive size and color. They are often addressed as “New World Parrots” and are associated with rain forests. The feathers of this bird are light blue, yellow, dark blue and dark red in color making them look extremely attractive. The most amazing thing to know about this bird is that it lives for approximately 75 years. This picture is qlikd in the Aperture Priority mode, as the original picture had only one macaw, in neutral lights. In photoshop the macaw was meticulously selected using the Polygonal Lasso Tool. Then the macaw is copied and pasted on a new file. Another file is created with this copied macaw and Image> Rotate canvas> Flip canvas Horizontal option is used to get the second macaw. Now the original picture is made black and white using Image> Adjustments> Desaturate option. The same steps were repeated to create the wooden frame once the picture was desaturated as we needed it in the B&W form. The frame was dropped at the desired place for the second macaw to sit. 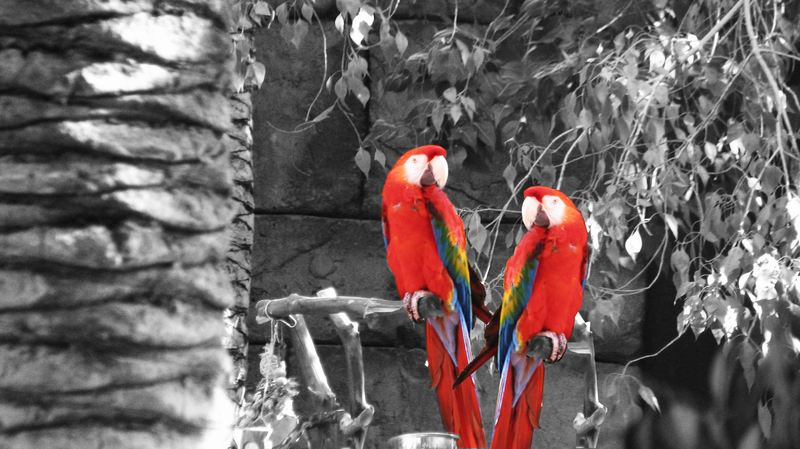 After this stage, separately the two macaws were brought back to the original picture in the form of layers. Lastly, the strong contrast option form the curves preset is used on all the layers to adjust the tonal range of the image. Once the picture is saved in the JPEG format Smudge Tool is used to give natural look to the second set of wooden frame. This is one way to highlight an object in the picture. This looks like a photography and photoshop class. Very well explaination of post production in photoshop. Kudos to you. What’s up Dear, are you truly visiting this web page regularly, if so then you will absolutely get nice know-how. Can I simply just say what a relief to uncover somebody who truly knows what they’re talking about online. side of the story. It’s surprising you are not more popular given that you surely possess the gift.